On Veterans Day, flag-raising ceremonies were held all over the metro area led by Scout troops, American Legion color guards and military personnel. Those in attendance saluted the flags as they rose toward the sky and often recited the pledge of allegiance or sang "God Bless America." But what about flags that have become too torn and tattered to be flown any longer? The U.S. Flag Code states that they should be destroyed in a dignified way, preferably by burning. 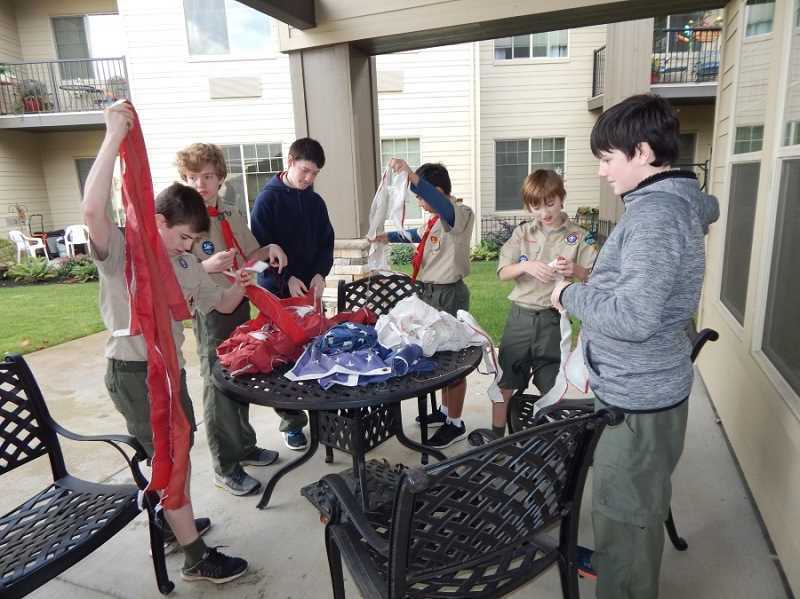 So while flags were being raised on Veterans Day, at the rear of Bonaventure in Tigard, a solemn ceremony conducted by members of Boy Scout Troops 419 and 423 was held to retire about half a dozen flags. 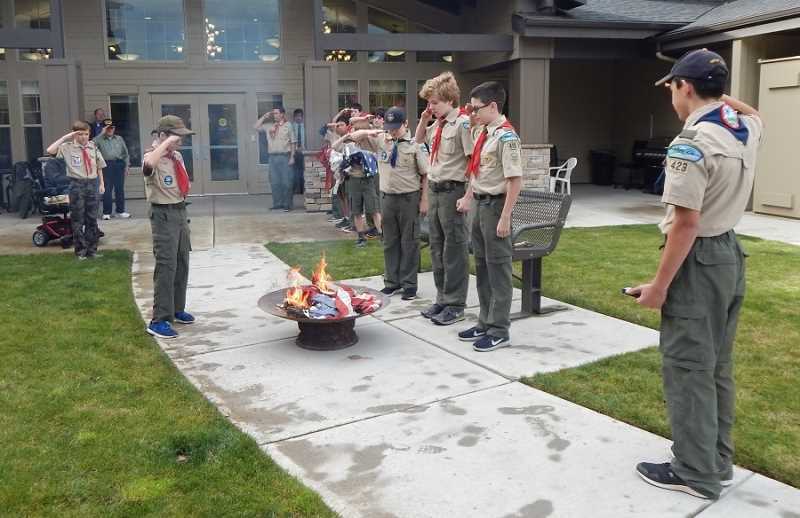 First, the Scouts brought firewood and lit a fire in a fire pit before they respectfully tore the red and white stripes of the old flags apart. This is a ritual they do about twice a year, and Scouts are among the organizations that include the American Legion and Veterans of Foreign Wars who are allowed to retire flags. Scoutmasters Jamie Laflin and Nick Mancuso were on hand to guide the Scouts through the process, and Laflin said, "A couple boys needed to do fire-building for a requirement, and this fulfilled it. "Each veteran will be given an opportunity to burn a stripe," Laflin added. "This is one last chance for them to honor the flag they served. You can't cut the field of blue with the stars on it because the union can't be separated. And the entire flag must be destroyed." One of the flags being retired had been flying in front of Bonaventure on a tall flag pole, and when the Scout troops raised a brand new flag that morning to replace the aging one. There are 53 veterans living at Bonaventure, according to Executive Director Lana Bucklers. And while most of them participated in a morning ceremony honoring them, only a few came outside for the ceremony to retire old flags. "We will probably be burning a lot of stripes ourselves," Laflin told the troops. First, several of the boys marched forward carrying one folded flag that had not been torn up to the fire pit. 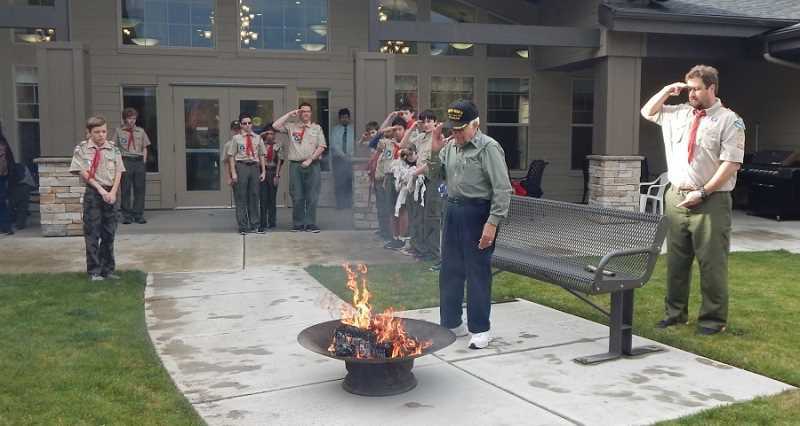 Everyone recited the pledge of allegiance, and the Scouts carefully unfolded the flag and draped it over the flames. They stood at attention, saluting the flag as the flames licked at it until it disappeared. A man walked solemnly to the fire pit carrying one stripe from a flag, carefully place it on the fire and saluted it until it was gone. Next was Art Rollin, who served in the U.S. Navy during World War II. 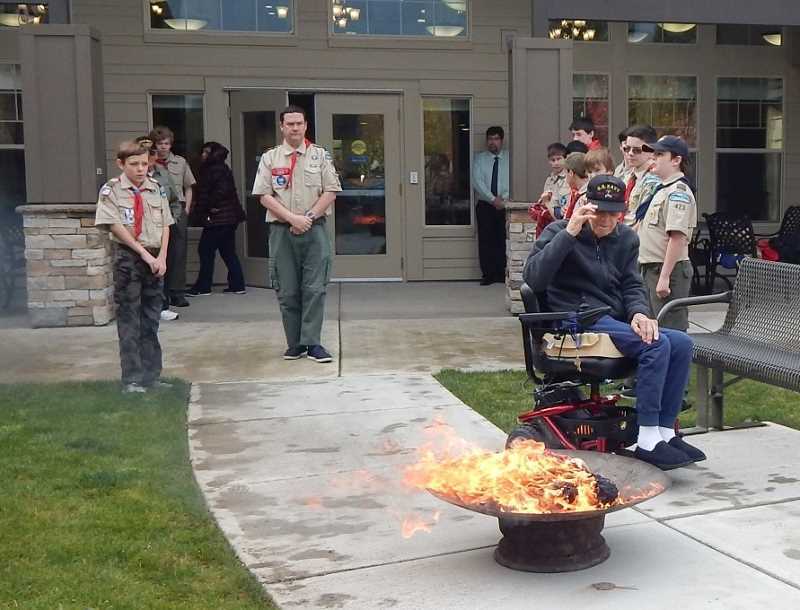 He rolled his wheelchair to the fire pit, placed a flag stripe on the fire and saluted it. Next was Joe Bruer, who was a Marine in WWII and was part of the assault on Iwo Jima, and last was Jerry Bonacker, who served in the U.S. Air Force in WWII. Each gave the burning flags one final salute as they disappeared. The Scouts then carried all the remaining red and white stripes and fields of blue to the fire pit and slowly placed them on the flames. The Scouts also gave the flags a final salute as they disappeared from sight. "Thank you to all the participants today for helping us to respectfully retire these flags," Laflin said. "And thank you for allowing us to retire the flag that you served under."